Guest, Peter and Wells, Nick 2007. Iron Age and Roman coins from Wales. Collection Moneta, vol. 66. Wetteren, Belgium: Moneta. For archaeologists and historians coins are a rich source of material for the study of the later prehistoric and Roman periods. This volume contains the details of 52,838 Iron Age and Roman coins recorded from 1,172 separate finds found within the boundaries of modern Wales (of which the vast majority are Roman. The corpus entries include descriptions of each find’s discovery and summaries of the coins recovered. 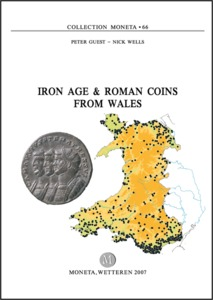 Three indexes, listing coin finds from Wales by location, find type (hoard or excavation etc.) and hoards by their most recent coins, complement the corpus. This is the largest published collection of ancient coinage from a region of Britain and the volume will be an invaluable resource for students of Roman Britain and the monetary history of the Roman Empire.